NYC hair stylist, styles Wigs for Jewish orthodox clients. Home/Blog/NYC hair stylist, styles Wigs for Jewish orthodox clients. Many New York women will admit to paying in excess of $300 for a good haircut. Especially on Manhattan’s glossy Upper East Side, where a polished appearance is de rigueur. But several hairdressers in the exclusive locale have told how a growing number of clients are paying up to $1,600 on maintaining not their own hair, but their wigs. According to orthodox Jewish law, a married woman must wear a wig, or, ‘sheitel’ for modesty, as only her husband is allowed to see her hair. But more and more are eschewing specialist Brooklyn salons in favour of high-end salons frequented by A-listers and royalty. One such woman, Linda, who spends $325 on a cut with Arsen Gurgov at the Louis Licari salon on Fifth Avenue, insists the indulgence is worth every penny. The home care nurse, 29, told the New York Post: ‘It’s my wig. I can’t just trust any woman with it. I can’t afford to get it wrong. I don’t think I’m extravagant in my day-to-day life, but if people consider my sheitel maintenance extravagant, so be it. My wig is not something I would try to save money on. Indeed, a sheitel is an investment. Typically purchased by a husband’s family for the first time, they retail for upwards of $500. The best quality wigs, usually made from European hair, can cost in excess of $6,000. Mr Gurgov says demand for his services from orthodox Jewish clients has been particularly high of late, due to Rosh Hashanah, which begins today. At celebrity stylist Orlando Pita’s trendy Meatpacking District salon, Orlo, around 25 per cent of the clientele are orthodox Jewish women, writer Doree Lewak reports. But a wig-maintenance session with the famed cutter comes at an extortionate $1,600 – twice the price of his regular haircuts. 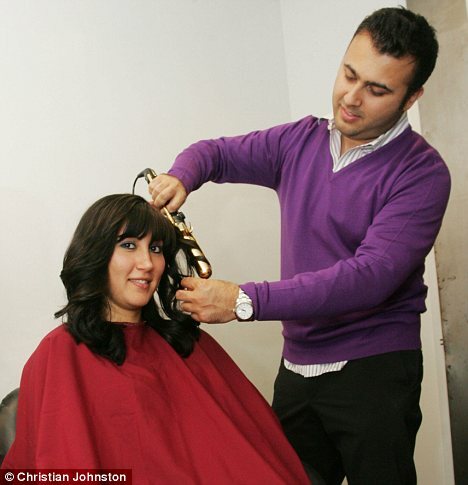 But stylist Mark Garrison, who says increasing numbers of orthodox Jewish women are paying in excess of $1,000 for two-to-three-hour sessions at his Upper East Side salon, admits the pressure to get a wig cut right is higher than with regular hair. -Arsen Gurgov, nyc hair stylist. admin2	2017-11-09T22:51:06+00:00	September 28th, 2015|Comments Off on NYC hair stylist, styles Wigs for Jewish orthodox clients.